Cannot stress it more that it is very important to pick out the right needle when you stitch with silk ribbons as it affects not only on a final result, but helps you to use the ribbon wisely. Using a wrong needle not only could make it difficult to work with it, but also may actually damage the ribbon. We don’t want that to happen as natural silk ribbons are not exactly a cheap commodity and require careful handling. 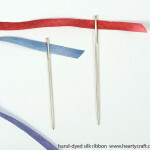 As a general rule use a chenille needle for ribbon embroidery. The chenille needle isn’t like your everyday sewing or stitching needle, it’s rather large, with a big eye and a sharp tip. Please look at the picture below to get an idea. One might wonder why do we use such big and thick needles, and what’s a point of this? The answer is very simple. When you make a stitch with the chenille needle, it leaves a large hole in fabric that lets the ribbon to pass through easily. If you use a thinner needle with a smaller eye the hole it leaves in the fabric is also small, and that requires more physical effort to pull the ribbon through, which may damage delicate weaving of natural silk. Silk ribbons are very delicate indeed, and every time you pull them through fabric it adds a little bit of wear and tear. Big chenille needles reduce the wear. 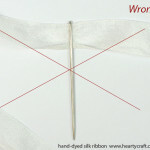 Look at the example of what happens with the silk ribbon when it’s worked with a wrong needle. As you see the ribbon has a sort of a run along its length, which does not look nice and definitely ruins the life-like appearance of hand dyed variegated colours. Thicker needle should have been used instead. Bear in mind, delicate silk ribbons are getting worn out even whilst you are stitching with a proper needle. That’s why it’s advisable to embroider with short lengths of ribbon, not more that 12 inches (30 cm) long. Some designers recommend to choose smaller size 20 or even 24 chenille needles for working with 4 mm ribbon (don’t get confused by bigger numbers, the bigger number means the smaller and thinner needle). I strongly advise against it. That would work for satin ribbon, which is very stiff and tough compared to pure silk one. Anyway, if unsure, here is a rule of thumb. If the ribbon looks ruined after making the first stitch, use a thicker chenille needle instead. When you do weaving with the silk ribbon, for example as for a spider web’s stitch where the ribbon does not go through the fabric, you can use a tapestry needle instead of a chenille one. 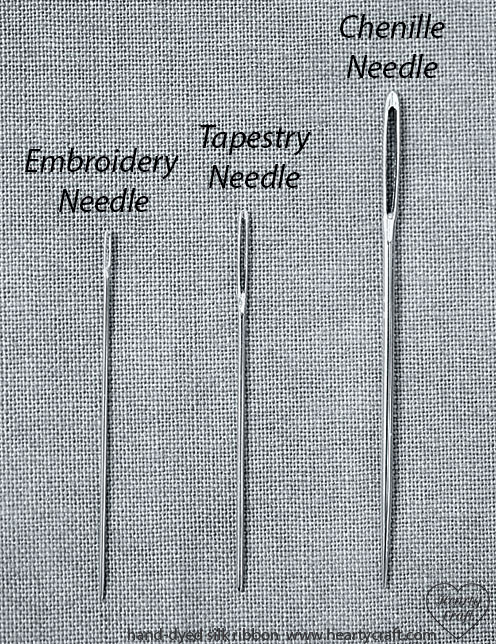 Tapestry needles are used for cross stitch and needlepoint. It has a blunt tip that makes it easy to work the stitch as the needle doesn’t pierce the spokes, but slips easily underneath. In this case using a thin tapestry needle is perfectly acceptable. 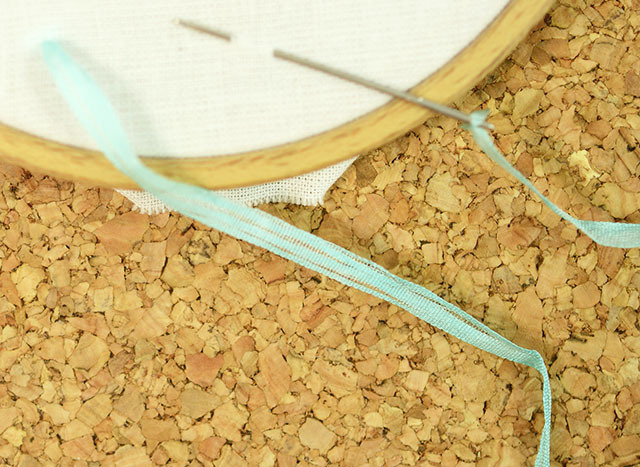 In particular, a small 20 or 24 size tapestry needle is perfect for weaving with 4mm wide silk ribbon. But still watch out, the ribbon should lie in the needle eye freely and not be creased or crumpled, otherwise it will get ruined. Ribbons should lie in the needle eye freely. This needle eye is too small for the ribbon. And finally, here is a link for John James needles website, where you can get very good chenille needles to start your wonderful journey in silk ribbon embroidery 🙂 As for ribbons there are lots of lovely colours in the Hearty Craft shop. Meanwhile, I’ve got to finish some stitching to share with you next week! This entry was posted in Blog Posts and tagged How to on 20th July 2014 by Zinaida. Great tutorial – clear, concise and informative. Thank you for sharing! I make hairbows with grossgrain what size needle would I use? Would it be a size 3?